My name is Errin and I’ve written this article to share a bit of my story with you. I’ve been a wife, a mother, and lover of cats for a very long time now. More recently, I’ve taken on the role of grandmother with a passion and deep sense of purpose unlike any other that I’ve experienced yet. My story has many twists and turns along the way to where I find myself today, and I’m sure there’s nothing about that fact that makes me much different than you. In treatment for binge eating disorder this year, I’ve come to understand that all of the things that make me who I’ve always thought I was were just window dressings. They were nothing more than labels that society gave me. They were a bunch of words that I identified with, because I thought that they made me who I am. And, they do, to some extent. But they were also a description of who and what I am in relation to other people in my life, or roles that I’ve filled. Mother, wife, coach, friend, assistant, advisor - they’re all just terms that society used in an attempt to illustrate to the world where I “fit it”. It’s recovery that has brought me a better understanding of who I really am, at my core. And it’s recovery that has taught me that it’s a far more satisfying feeling to find where I belong, just as I am, instead of trying to achieve a new label to fit in. Actually, through therapy and focussing on my recovery, I uncovered that journaling is one of the most effective tools for me to connect to the process of finding my way into that core of mine. It’s a way for me to understand what it is about me that makes me, well, me. Journaling has been such an eye-opening practice for me. It’s lead me to some wonderful discoveries about myself and taken me in a whole different direction in just about every part of my life. Before I started treatment in May of this year, I’d never been able to keep a journal. Growing up I was one of those little girls who loved the idea of keeping a cute lockable diary under my pillow that I could pull out every night and scribble my secrets into before falling to sleep. I’d hide the tin key in a special sock at the back of my sock drawer, ensuring that my secrets were safe from the invading eyes of my annoying older brother. In reality though, I couldn’t do it. I couldn’t get into the habit of actually writing down my thoughts. I’d tried multiple times at different stages in my life. 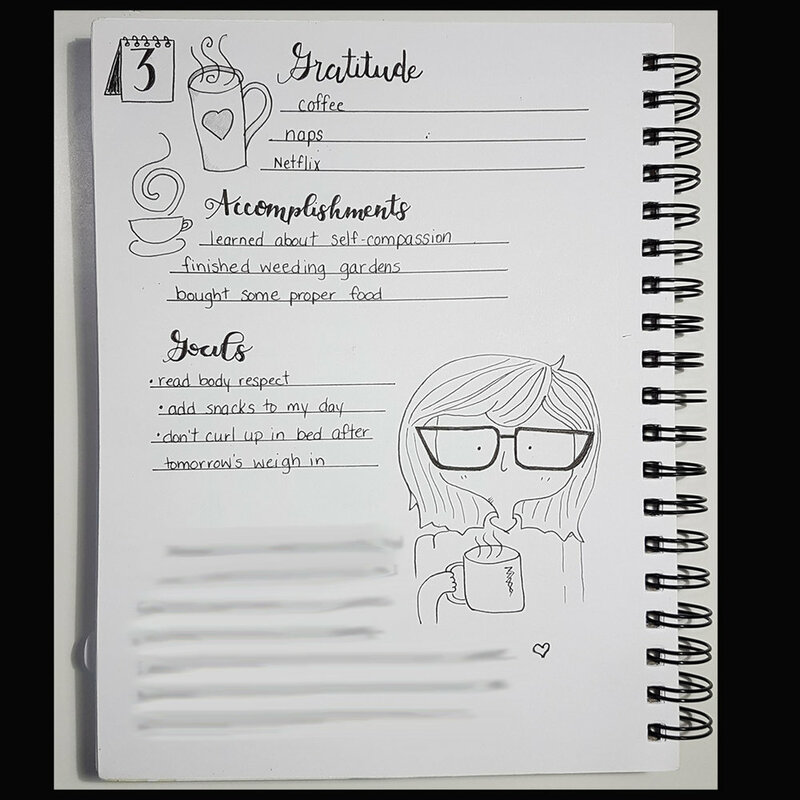 I’ve even tried a variety of journaling tools from simple notebooks to elaborate journals, and even journaling apps and online diaries. Each new attempt was usually at a time in my life when I had something exciting or traumatic going on but it wouldn’t last more than a few days. Sometimes I’d forget to write for several consecutive days and then throw in the towel on the whole idea, telling myself that no matter how badly I wanted to do it, it just wasn’t “me”. Other times, I’d open my journal every day for weeks, but then struggle to write anything at all. I had this fear that the challenging thoughts and feelings would somehow become more real by writing them down, and I just wasn’t ready or equipped to face them. To be completely honest with you, the same thing happened to me as I was attempting to write this blog post. This is the first time I’ve written anything, since high school, that’s meant to be read by the public. I’ve set aside several blocks of time to write over the past couple of days, and each time I’ve been unable to get any words onto my screen that make much sense. I’ve spent my time writing about the superficial bits of my story that really don’t address anything that will be of any help to anyone else. But I was overlooking the most obvious thing. I wasn’t sharing the revelation that brought me to understanding why journaling had never worked for me in the past, and that’s the part of my story that can really help other people. The discovery that is now a very important part of not only my recovery, but of the person that I’m becoming is something valuable that I can share with the world. I needed to draw in my journals, not write! That’s it. There it is - my revelation. I had never been interested in drawing, but in recovery, I’ve found that on days that I can’t seem to make words come out, I can draw and it helps me to feel some relief. It helps me to quiet the noise in my mind, and let go of some of the negative feelings. So some days, I write, and some days I draw, paint or collage. What a relief it was to finally understand! The thing that was holding me back from tapping into the powerful healing that can come from journaling wasn’t that I am not a writer, or that journaling just isn’t my “thing”, but that I was just thinking about the act of journaling with too narrow of a perspective. That childhood fantasy of writing in my little diary had built a belief in my mind that the “best’ way to journal was with words and I’d been unable to see that the belief of what journaling is supposed to be was keeping me from being able to do it at all. Discovering this lead me to wonder if other people struggle with journaling the way that I used to. And I want to help those people. I want to show them that writing isn’t the only way to journal. I want them all to know that it doesn’t have to be all one way or the other either. There are multiple ways to do anything and everything. I am committed to healing myself all the way to full recovery. And now that I know the benefits of looking inside myself to see the barriers I’ve created to keep me from being successful, I know that turning to my journaling practice is the how I can find the ways to take those barriers down. Now, ask yourself, what beliefs are holding you back? The answers can often be found in yourself, and if you keep practicing, maybe you’ll also find some in your journal. Errin refers to herself as an Artist by Accident. She fell into her love of art when she embarked on her journey to recovery from Binge Eating Disorder earlier this year. She has often been described by friends and peers as driven, passionate, helpful, creative and thoughtful. She has learned, through treatment, how to use those attributes to begin to heal, with the help of her recovery team. She has always been the kind of person who figures out how to get things done, even when it appears that her lack of experience may impede her. She enjoys the company of others who, like herself, have a passion for learning new skills. She worked as a (self-taught) graphic designer at a newspaper for years before moving into radio advertising. From there, she transitioned to a career as an advertising and marketing manager for an investment firm. She fell in love with Roller Derby while working as an Investment Advisor, and her enthusiasm for the sport lead her away from the financial world and into the fitness industry where she worked as a Personal Trainer and Sports Nutrition Specialist. Now, with her newly found love of art and all things healing/self-love, she is focused on using her experiences to help others who suffer in ways similar to her own struggles.